DC has quite a bit going on at San Diego Comic Con this year. They have a multitude of panels on comics, movies and video games. 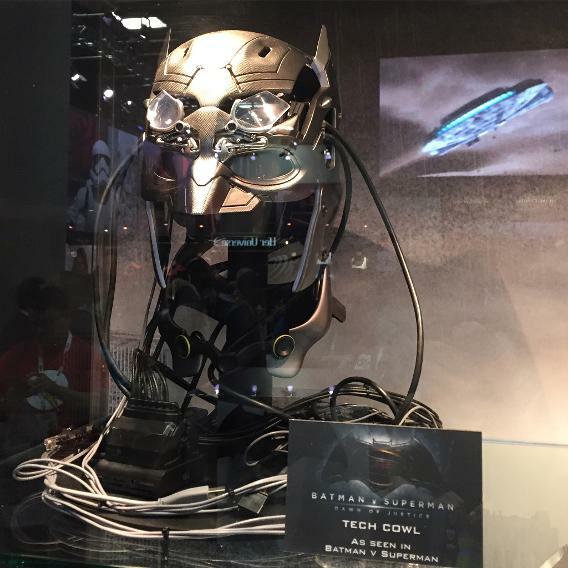 One of the cool things in the DC booth are the props / costume of Batman from the upcoming Batman Vs Superman: Dawn of Justice film. You can see all the different weapons, gadgets, bombs and the armored suit that Bruce Wayne has created to take down Superman. Missing from these items is the Kryptonite Ring that has appeared in some of the comics. Even though Batman's weapons look cool and a bit foreboding I have a hard time seeing him do too much damage to Superman without Kryptonite involved. Still the bombs, grenade launcher looking gun all look menacing. Also the helmet called the Tech Cowl has some noticable bells and whistles on it. You can see that its eyes light up in the trailer but with a closer look here you can see many wires running through the back of it. It is likely connecting Bruce to his Batcomputer or perhaps to the Batmobile.